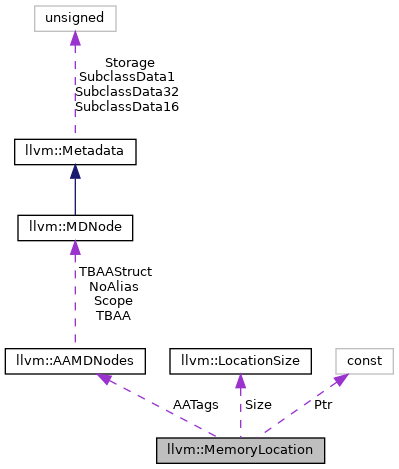 This abstraction can be used to represent a specific location in memory. The goal of the location is to represent enough information to describe abstract aliasing, modification, and reference behaviors of whatever value(s) are stored in memory at the particular location. The primary user of this interface is LLVM's Alias Analysis, but other memory analyses such as MemoryDependence can use it as well. Definition at line 174 of file MemoryLocation.h. UnknownSize - This is a special value which can be used with the size arguments in alias queries to indicate that the caller does not know the sizes of the potential memory references. Definition at line 179 of file MemoryLocation.h. Definition at line 243 of file MemoryLocation.h. Definition at line 34 of file MemoryLocation.cpp. References llvm::Instruction::getAAMetadata(), llvm::Module::getDataLayout(), llvm::Instruction::getModule(), llvm::LoadInst::getPointerOperand(), llvm::Value::getType(), and llvm::LocationSize::precise(). Referenced by llvm::AliasSetTracker::add(), canMoveAboveCall(), llvm::canSinkOrHoistInst(), checkFunctionMemoryAccess(), llvm::MemorySSAUtil::defClobbersUseOrDef(), llvm::DependenceInfo::depends(), llvm::MemorySSAAnnotatedWriter::emitInstructionAnnot(), findSafeStoreForStoreStrongContraction(), GetLocation(), getLocation(), getLocForWrite(), llvm::AAResults::getModRefInfo(), llvm::MemoryDependenceResults::getNonLocalPointerDependency(), llvm::MemoryDependenceResults::getSimplePointerDependencyFrom(), llvm::DependenceInfo::getSplitIteration(), handleEndBlock(), isSafeToMove(), isSafeToPromoteArgument(), memoryIsNotModifiedBetween(), moveUp(), llvm::MemoryDepChecker::Dependence::print(), propagateMetadata(), and llvm::AAEvaluator::run(). Definition at line 44 of file MemoryLocation.cpp. References llvm::Instruction::getAAMetadata(), llvm::Module::getDataLayout(), llvm::Instruction::getModule(), llvm::StoreInst::getPointerOperand(), llvm::Value::getType(), llvm::StoreInst::getValueOperand(), and llvm::LocationSize::precise(). Definition at line 55 of file MemoryLocation.cpp. References llvm::Instruction::getAAMetadata(), llvm::VAArgInst::getPointerOperand(), and llvm::LocationSize::unknown(). Definition at line 63 of file MemoryLocation.cpp. References llvm::Instruction::getAAMetadata(), llvm::AtomicCmpXchgInst::getCompareOperand(), llvm::Module::getDataLayout(), llvm::Instruction::getModule(), llvm::AtomicCmpXchgInst::getPointerOperand(), llvm::Value::getType(), and llvm::LocationSize::precise(). Definition at line 74 of file MemoryLocation.cpp. References llvm::Instruction::getAAMetadata(), llvm::Module::getDataLayout(), llvm::Instruction::getModule(), llvm::AtomicRMWInst::getPointerOperand(), llvm::Value::getType(), llvm::AtomicRMWInst::getValOperand(), and llvm::LocationSize::precise(). Definition at line 204 of file MemoryLocation.h. Definition at line 127 of file MemoryLocation.cpp. References Arg, assert(), F(), llvm::Instruction::getAAMetadata(), llvm::CallBase::getArgOperand(), llvm::CallBase::getCalledFunction(), llvm::TargetLibraryInfo::getLibFunc(), llvm::DataLayout::getTypeStoreSize(), llvm::TargetLibraryInfo::has(), llvm::LocationSize::precise(), and llvm::LocationSize::unknown(). Referenced by llvm::AliasSetTracker::add(), GetLocation(), and llvm::AAResults::getModRefInfo(). Definition at line 238 of file MemoryLocation.h. Definition at line 106 of file MemoryLocation.cpp. Referenced by llvm::AliasSetTracker::add(), getLocForWrite(), llvm::BasicAAResult::getModRefInfo(), hasUndefContents(), and moveUp(). Definition at line 110 of file MemoryLocation.cpp. Definition at line 114 of file MemoryLocation.cpp. References C, llvm::Instruction::getAAMetadata(), llvm::MemIntrinsicBase< Derived >::getLength(), llvm::MemIntrinsicBase< Derived >::getRawDest(), llvm::LocationSize::precise(), Size, and llvm::LocationSize::unknown(). Definition at line 85 of file MemoryLocation.cpp. Referenced by llvm::AliasSetTracker::add(), getLocForRead(), llvm::BasicAAResult::getModRefInfo(), hasUndefContents(), and moveUp(). Definition at line 89 of file MemoryLocation.cpp. Definition at line 93 of file MemoryLocation.cpp. References C, llvm::Instruction::getAAMetadata(), llvm::MemIntrinsicBase< Derived >::getLength(), llvm::MemTransferBase< BaseCL >::getRawSource(), llvm::LocationSize::precise(), Size, and llvm::LocationSize::unknown(). Definition at line 207 of file MemoryLocation.h. References llvm::Instruction::getOpcode(), llvm::SPII::Load, MI, llvm::None, and llvm::SPII::Store. Definition at line 248 of file MemoryLocation.h. Definition at line 254 of file MemoryLocation.h. Definition at line 260 of file MemoryLocation.h. Definition at line 266 of file MemoryLocation.h. References AATags, Ptr, and Size. The metadata nodes which describes the aliasing of the location (each member is null if that kind of information is unavailable). Definition at line 195 of file MemoryLocation.h. Referenced by llvm::SCEVAAResult::alias(), llvm::ScopedNoAliasAAResult::alias(), llvm::TypeBasedAAResult::alias(), llvm::objcarc::ObjCARCAAResult::alias(), llvm::BasicAAResult::alias(), llvm::AliasSetTracker::getAliasSetFor(), llvm::DenseMapInfo< MemoryLocation >::getHashValue(), llvm::ScopedNoAliasAAResult::getModRefInfo(), llvm::TypeBasedAAResult::getModRefInfo(), getWithoutAATags(), operator==(), llvm::TypeBasedAAResult::pointsToConstantMemory(), llvm::objcarc::ObjCARCAAResult::pointsToConstantMemory(), llvm::MemoryDepChecker::Dependence::print(), llvm::RuntimePointerChecking::print(), SortNonLocalDepInfoCache(), and underlyingObjectsAlias(). Definition at line 182 of file MemoryLocation.h. Referenced by llvm::SCEVAAResult::alias(), llvm::AMDGPUAAResult::alias(), llvm::objcarc::ObjCARCAAResult::alias(), llvm::CFLAndersAAResult::alias(), llvm::CFLSteensAAResult::alias(), llvm::BasicAAResult::alias(), llvm::GlobalsAAResult::alias(), llvm::AAResults::callCapturesBefore(), llvm::slpvectorizer::BoUpSLP::VLOperands::dump(), eliminateDeadStores(), findSafeStoreForStoreStrongContraction(), llvm::AliasSetTracker::getAliasSetFor(), llvm::MemoryDependenceResults::getDependency(), llvm::DenseMapInfo< MemoryLocation >::getHashValue(), GetLocation(), llvm::BasicAAResult::getModRefInfo(), llvm::GlobalsAAResult::getModRefInfo(), llvm::AAResults::getModRefInfo(), llvm::MemoryDependenceResults::getNonLocalPointerDependency(), llvm::MemoryDependenceResults::getSimplePointerDependencyFrom(), getStoredPointerOperand(), getWithNewPtr(), isOverwrite(), isPossibleSelfRead(), operator==(), pointerInvalidatedByLoop(), llvm::AMDGPUAAResult::pointsToConstantMemory(), llvm::objcarc::ObjCARCAAResult::pointsToConstantMemory(), llvm::BasicAAResult::pointsToConstantMemory(), llvm::RuntimePointerChecking::print(), llvm::CFLAndersAAResult::query(), llvm::CFLSteensAAResult::query(), removeAccessedObjects(), removePartiallyOverlappedStores(), and underlyingObjectsAlias(). The maximum size of the location, in address-units, or UnknownSize if the size is not known. Definition at line 191 of file MemoryLocation.h. Referenced by llvm::SCEVAAResult::alias(), llvm::objcarc::ObjCARCAAResult::alias(), llvm::BasicAAResult::alias(), eliminateDeadStores(), llvm::AliasSetTracker::getAliasSetFor(), llvm::DenseMapInfo< MemoryLocation >::getHashValue(), getWithNewSize(), isOverwrite(), operator==(), llvm::objcarc::ObjCARCAAResult::pointsToConstantMemory(), llvm::CFLAndersAAResult::query(), removePartiallyOverlappedStores(), and SortNonLocalDepInfoCache().